Do you want to make Healthy Choices, but are stymied by all the confusing information? 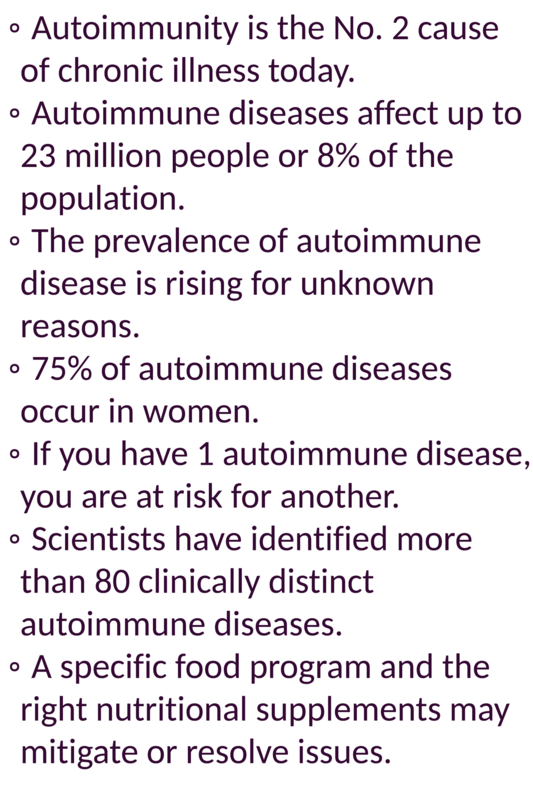 Autoimmune disease is a complex, multi-faceted process that the medical community is still striving to fully understand. Today it is particularly relevant, with a large prevalence of several diseases and disorders such as type 1 diabetes, rheumatoid arthritis, psoriasis, thyroiditis, multiple sclerosis, and many others. Theorized causes of autoimmunity range from chronic stress, to leaky gut, to vitamin D insufficiency or deficiency, among many others. 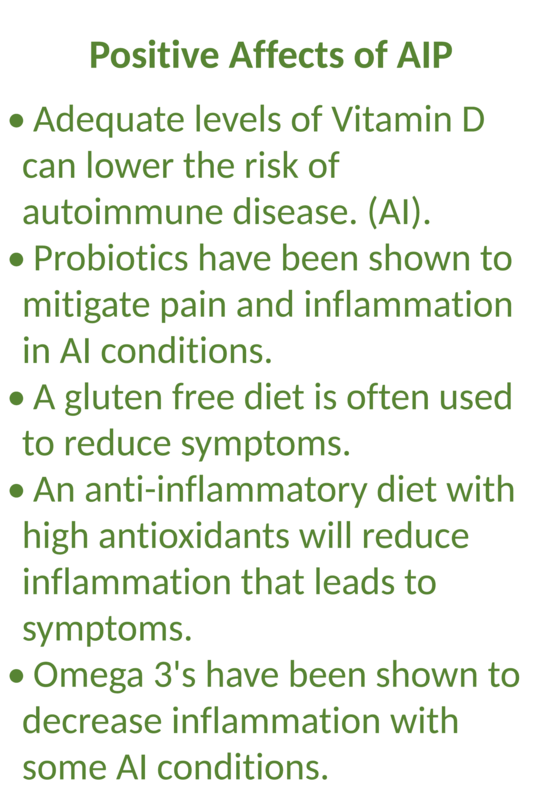 While there are several other autoimmune diet protocols that claim to mitigate autoimmune disease, I use the Autoimmune Paleo diet with my clients. I have seen success with clients ranging from reduction of symptoms, relief of symptoms and reduction of medication to total remission. I have seen individuals truly gain their life back in the process. The autoimmune paleo diet program helps to heal the immune system and the gut lining, using a low inflammatory protocol. The AIP program is a specialized elimination. It is more specific in the foods eliminated over a period of 12 weeks. 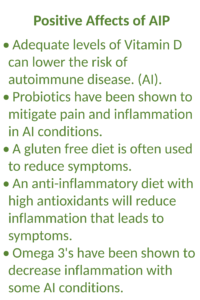 Many elimination diets are not complete enough and often do not remove immune triggers that promote inflammation in the gut. AIP works to calm inflammation in the intestines, while calming inflammation in the body. It can be utilized for any autoimmune or inflammatory disease. 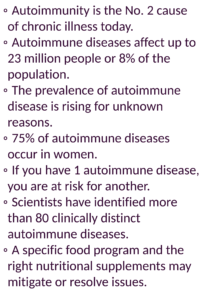 AIP addresses the root cause, that is the driver of the autoimmune inflammation; the gut! Following the AIP Program, is more a lifestyle because it becomes how you live, and eat, on a day to day basis. My autoimmune clients that have followed this pattern have been successful at having their disease go into remission or dramatically mitigated. Or a Free 15 minute chat to learn if this is right for you! It's true! There are foods that must be abstained from for a short while. However, once you get the hang of it, it's like fitting into your favorite shoes. I have found that a phased in approach works well with my clients. All the foods are not taken out at one time. It's done step by step. This lowers the shock value. and allows time to adjust to the changes diet, lifestyle and learn new recipes. This phase process takes 10 – 12 weeks. Some individuals prefer to dive into the deep end of the pool, and take all the foods out at one time. Either method works! It really depends on your style in making life changes, and what you feel comfortable with. To the right is a short list of some of the foods that are eliminated. After the 12 week time period, re-introducing foods can begin. Not all individuals have to abstain from all the foods, all the time. 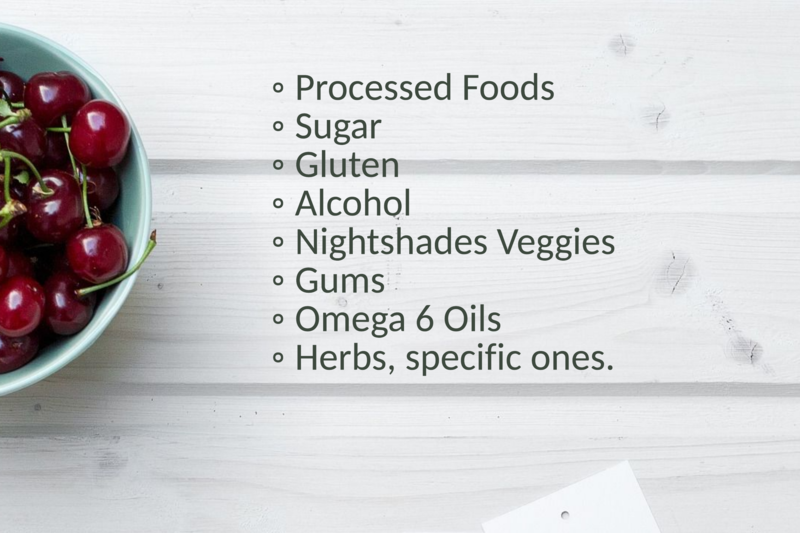 Many foods can be added back into the diet. It’s a matter of trial and correction to see which foods you can put back into your diet, how often and in what amounts. *SAD is the standard american diet. Considering your Health? Ready to get started? Set up a consultation or a free 15 minute chat to learn if this is a fit for you!